At Blue Forest, we strongly believe that the best place to be is up in the trees. So we got rather excited when we heard about Treetop Nets – the UK’s first treetop adventure park entirely made from suspended netting based in Brockhole, Cumbria. Treetop Nets is open to children of all ages and adults, and they also cater for school groups and birthday parties, and team building events. We were delighted to discover that we had a lot in common with Treetop Nets – like us, their approach is also focused on getting people outside, connecting with nature and having fun. Their suspended playground features slides, running surfaces, trampolines, walkways and tunnels all constructed out of specially created netting. The fantastic thing about Treetop Nets is that there is no need for safety harnesses so they are ideal for very young children from ages 3+ to play safely in the trees. Treetop Nets are now on the verge of opening their second site and they very kindly agreed to share their story with us. The origins of Treetop Nets began around seven years ago. Cedric Chauvaud, one of the world’s best sailors and rope experts, had spent years working with nets on his boats. He was interested to see the tools of his trade used as safety nets on a visit to the circus, but it was when he was contacted by environmental researchers working in the Amazon rainforest that his ideas began to take shape. The researchers needed a way to study the higher levels of the forest canopy without causing any invasive damage to the trees, so he designed a series of rope bridges and nets built high up in the branches for them. He realised that it would be fantastic to replicate the idea back at home in France in the form of a children’s playground, initially trialled in his hometown of I’lle de Groix. The attraction was so popular that he went on to build many more across France, one of which was visited a few years later by Mike Turner who was on holiday from the UK with his son Vincent, then aged five. 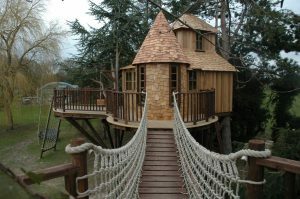 Mike already ran an existing treetop assault course in Yorkshire, which was popular with older children and adults alike, but required strict supervision restrictions and age limitations for younger children. The secure nature of the net playground makes the concept ideal for those who may find the usual rope assault courses a little too intimidating so Mike knew that the concept was perfect for his business. He made contact with Cedric who agreed to bring his ideas to the UK and the first site opened in 2014. Now Mike, Cedric and their team of ex fishermen and sailors are adding the finishing touches to their second Treetop Nets playground in Lightwater Valley, Yorkshire. Whilst the original site in Windermere has welcomed over 60,000 visitors since its launch and is now an award-winning tourism attraction, the new playground will be even bigger. Just like a Blue Forest treehouse, the design will be especially adapted around the individual landscape and positioning of different trees, so visitors will be able to explore a completely unique layout. Like Blue Forest, the whole concept behind Treetop Nets is to teach children from a young age how to enjoy the great outdoors, how to interact with their natural surroundings and how to face a range of different ‘challenges’. Blue Forest have certainly kept this focus in mind whilst designing woodland playgrounds for places like Birr Castle, Belton House and Dalkeith Country Park. If you are considering a woodland playground or treehouse for your business, then please download a brochure or give someone from the Blue Forest team a call on 01892 75 00 90 and we will be happy to discuss your ideas with you in more detail.